Chef Gordon Craig is a happy man. This is his dream job: a place of his own. His path to get here has included stints at the multi-Michelin starred Waterside Inn, the Plumed Horse, and more recently a partnership at Field. After a year at the helm of Stockbridge's Field Grill, he's taken the opportunity to rebrand in his own image, journeying from session musician to conductor. Now he's orchestrating proceedings; constantly tweaking, refining, perfecting. With Taisteal (Gaelic for travel), Gordon now creates dishes based on the best local Scottish produce, laced with inspiration from his cook's tours, whether to Copenhagen or China (or the Chinese supermarket). The pivot has lost the odd regular but quickly gained a crowd keen to dip their toes in international waters. He claims that future destinations – South America, he says – will determine the direction of his dishes and enable evolution, keeping both customer and kitchen satisfied. So to start: scallops and black pudding (so far, so Scottish) but with pomegranate, satay and a shard of samosa pastry, a friendly shark's fin protruding from hand-dived depths. 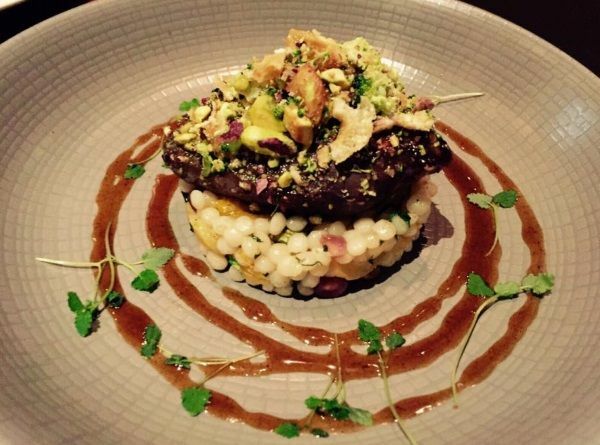 Ras al hanout-glazed pigeon breast rests on a disc of giant couscous, scattered with pistachio like a glittery green cupcake. The fusion is not forced though, and doesn't feel like a twist for novelty's sake. For mains, a shiitake samosa shakes up a maple and five-spice Gressingham duck with grilled pak choi and edamame beans. Two-textured deep-fried butternut squash gnocchi stand out alongside venison haunch with sesame seeds and cassis jus. The fusions are subtler at dessert: sweet is sweet. A chocolate and citrussy yuzu fondant reveals itself like a boiled egg receiving soldiers, prettied with orange curd powder and matching sorbet. And citrus plays again in a luscious lemongrass parfait with cracks of honeycomb and coconut ice cream. It's possible to interpret 'taisteal' as a conceptual culinary journey: this Taisteal hints at the exotic without being elite, inaccessible or scary.